WAKE UP EVERYONE! It’s time to grab a bargain! I’ve had so many people tell me how much they love my bedtime patterns, especially my Winter Pyjama and my Winter Nightie Patterns that I thought I’d give everyone the chance to own them. ‘Sew’, until the end of May, 2017 I’m selling all my bedtime patterns at 20% Off the Retail Price. ‘Now all these dolls have their first winter night clothes. I’m having too much fun here! 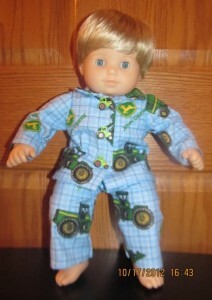 I love how easy Rosie makes altering her patterns to fit other sized dolls. 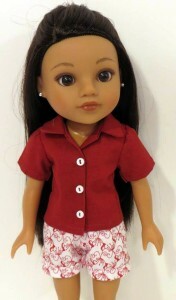 Crystal has found that the 18 inch and American Girl Winter Pyjama pattern also fits Bitty Baby. All she had to do was shorten the length of the long pants by about 1 ½” (3cm). 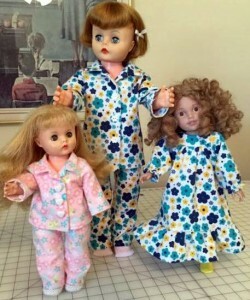 To take advantage of this awesome offer and start sewing gorgeous bedtime clothes for your doll, simply enter Bedtime20 in the coupon box during checkout. Offer expires 31 May, 2017.